Most everyone in my circle knows I am foodie who fancies the gourmet. I don't deny that fact, but will say the balance seeking Libra in me will flirt with the dark side of food on occasion. How can a person really appreciate Proscuitto di Parma if they have never tasted Spam? For instance I find great satisfaction in a ball park hot dog, loved a New Year's appetizer made with green olives from a jar, and yes, I was the one who brought the Bugle snack to our Superbowl party. Once, in a pinch, I even finished a broccoli soup with (shhh) Velveeta. Of course, the person I served it to immediately looked at me with an expression of horror and said, "did you make this with processed cheese?" At that moment I realized I had refined the palates in my life to the point I couldn't even take a kitchen shortcut. Is this some kind of joke? 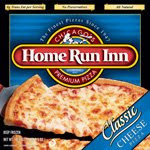 I knew those kids liked that pizza too much for me to get away with my kitchen shortcut; it was just a frozen Home Run Inn cheese pizza. 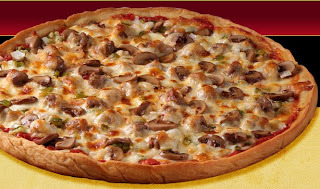 As visions of condensed cream of mushroom soup started swirling in my head I comforted myself in the simple fact the pizza was, at least, all-natural. I am left feeling defeated and I am sure H's mom is, too. I started making my own Friday night pizza after being inspired by my friend A and now all our crust making efforts have been thwarted by one slip in the frozen food aisle. I am ashamed to admit our children rated our cooking below a high quality frozen brick of flour and cheese that cooks up in less than 20 minutes. I am having flashbacks to the dinner I made for Leif years ago...I slaved all day in the kitchen only to have him comment that it, "wasn't his favorite Hamburger Helper." Devastating. In an effort to redeem myself, and afford A the opportunity to take her pizza power back, I have researched Home Run Inn Pizza Crust. Hopefully the following recipe will be close enough to quiet the frozen food loving beasts! Begin by dissolving yeast in 110-115 water and let bloom for five minutes. Add half of the flour and salt and begin to mix using the dough hook on stand mixer. Once it comes together add the oil and half of the remaining flour (3/4 of all flour is now in the mixer). Once that comes together, knead on high speed for 5 minutes. Add remaining flour and mix until combined then knead for 3 additional minutes on low speed. If it seems a little to dry, add water one teaspoon at a time until it comes together. Place in bowl and cover with a warm wet cloth then let the dough rise in a warm oven for two hours with a pan of hot water on the rack below to provide some humidity so dough doesn't get a crust. Punch the dough down and let it rise again for another two hours. Shape the dough into a 16" round taking care to make a 1/2" high and 1/2" wide rim on the crust. Top as desired and bake at 475 degrees for about 12 minutes. *This recipe (found through Chowhound) does follow the Home Run ingredient list quite closely. I guess the corn oil is the secret...I didn't even know you could buy corn oil anymore! I had a feeling you were going to say this. That's ok -- guess what my favorite food was when I was his age. Fish sticks! My mom would make homemade meals every day, and my favorite food was fish sticks. I'm so used to eating frozen pizzas now. I think I'm gonna try making my own, thanks for the crust recipe! I am totally cracking up!!! My favorite food as a kid was Chef Boyardee--Mini Bites Mini Ravioli with Mini Meatballs (oooooh my)....Chris' was taco pizzas from his SCHOOL!!! Seriously, school food?!? !